As different real estate asset classes continue to show differential growth patterns in India, having a clear vision of forthcoming trends becomes mind boggling, especially for investors. That’s why successful asset allocation strategies between various asset classes now requires higher amount of research, focus and investment experience. 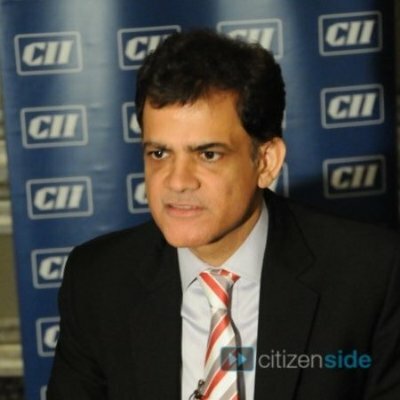 This possibly explains why focus of private equity players into real estate has increased considerably even as performance of real estate stocks on the Bombay Stock Exchange (BSE), India’s legacy and a popular stock exchange, has been poor from the GFC (global financial crisis) phase of 2008 to 2016. If we look at the sectoral market-cap data, the BSE realty sector’s market-cap has only seen de-growth over the last eight years since the financial crisis of 2008. As against that, the market-cap of SENSEX has been recovering by 8% annually during the same period. Sectors that are interest rate sensitive (like real estate) such as the automobiles and banking also witnessed positive growth. Metals sector, which we know has been subject to adverse conditions due to sluggish demand as well as prices, also recorded marginally positive growth in market-cap. 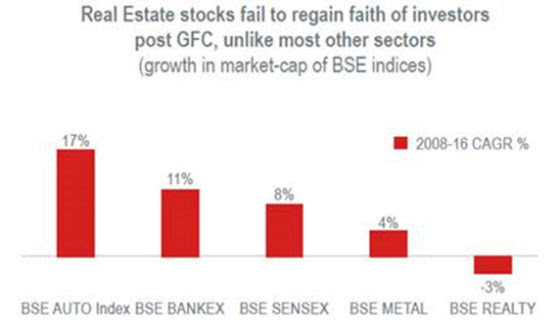 Therefore, real estate is one of the weakest performing sectors in the equity market currently. However, private equity investors appear to be going bullish on Indian real estate over the last couple of years, attracted by the opportunity to cherry pick assets available at a deep discount. 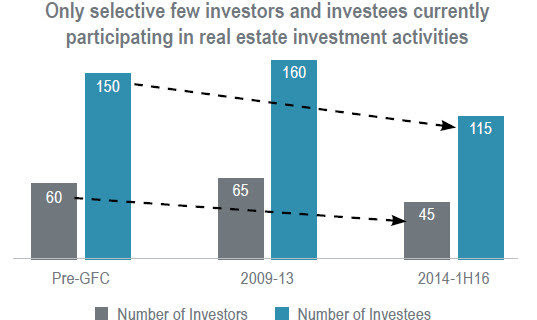 Many transactions have taken place since the beginning of 2015, in which both foreign and domestic PE funds selectively picked-up office, retail and/or residential assets at attractive valuations given the weak bargaining position of the developer or landlord. Quality research and good market knowledge give an edge..! Unlike in the high-growth period prior to the crisis, where many firms entered India and invested in multiple real estate projects assuming a sustained period of price rise, the current phase is that of limited participation by few large but focused funds. Many of these funds have several years of experience investing in real estate and have a proficient track record. Their investment strategy is to only look at a narrow range of investment options, which is visible through the reduced number of investee firms who are receiving equity/ debt funds. 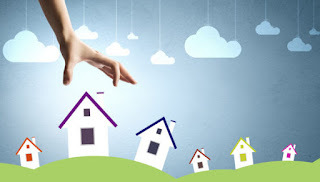 In a nutshell, real estate still offers an opportunity to earn good returns, although the investor must be equipped with quality research, good market knowledge and sound advice. The varying speeds of growth of the Indian economy and the industry will enable only the informed and learned investors to be able to earn as much.